Dissatisfied with her life, London journalist Ceri D'Altroy decides to resign from her job, rent out her flat and move down to Leeds to carve out a new career for herself. Ceri once studied psychology in Leeds and accepts a teaching position at a college, which enables her to carry out her own research. Moving into a house share, Ceri begins her new life. But will a different city mean a different life? Since discovering Dorothy Koomson a couple of years ago, I've been slowly working my way through her backlist of books. As Valentine's Day is approaching, I decided The Cupid Effect would be next on my list. 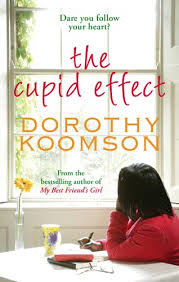 The Cupid Effect is quite different from Dorothy's later novels, both in style and content. It's a much lighter read and full of witty observations, which I enjoyed. Ceri is a very likable character and although she often has very sarcastic comments, she usually keeps them to herself. Ceri felt like she was suffocating from the drama of other people's lives while in London, always finding herself caught up in their problems as everyone seemed to gravitate towards her. And this doesn't seem to change when she packs up and moves to Leeds. Ceri moves into a house with two students, Jake and Ed, and I loved the instant bond between them, particularly with Jake. I can imagine them continuing to live together beyond the novel and getting up to all sorts of adventures. I also enjoyed the friendship between Ceri and her former tutor, Jess. They're obviously comfortable in each other's company and had no problem being open and honest with each other.